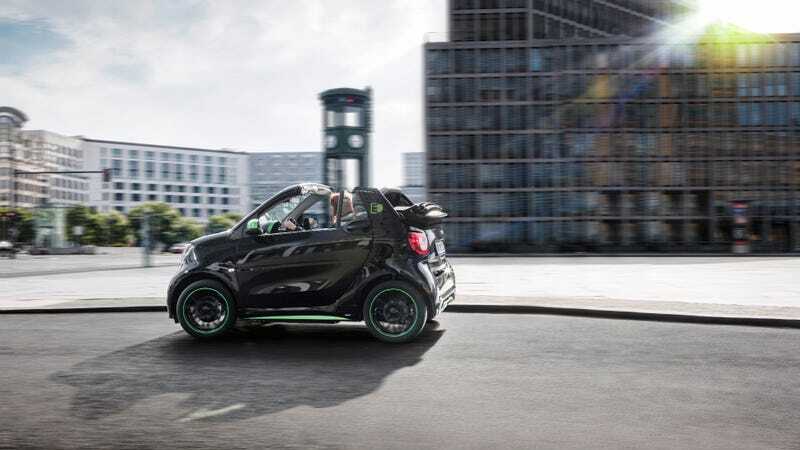 What Do You Want To Know About The Electric Smart ForTwo? Long name, tiny car. I’m off to drive the 2018 Smart ForTwo Electric Drive Cabrio. I love weird, quirky, teeny city cars, and the Smart car has always been as close to a mass-produced microcar that the U.S. gets in modern times. The new one even looks properly cute! So, what do you want to know about it? The entire cram-tastic Smart car lineup is going electric, which makes sense, given that it would be hard to pack for a road trip for more than one person in the little ForTwo. I’m hoping the electric drivetrain gives it the low-end oomph that can make tiny cars a real blast, but I’m also skeptical: will it still be fun with only a one-speed transmission? It’s supposed to have 80 horsepower and 118 lb-ft of torque, but then again, it weighs just 2,383 lbs. Promising! The 17.6 kWh battery sits down low in the car, which also sounds good, but the ForTwo’s always been a tall car, and convertibles all too often don’t handle as well as their hardtop counterparts. Will that low battery be enough to make a car whose funky proportions will never, ever pass the SCCA’s autocross “Rollover Potential Guidelines” handle well anyway? I’m weirdly excited about one feature on the spec sheet: Crosswind Assist. The tendency for tiny cars to get blown around at freeway speeds are their one lone downfall of having a subcompact. If this works well, it could be a game-changer for those of who who feel like most cars are just too big. I’m less excited about the “Cabrio” part, and not just because I’m not a fan of convertibles. Personal preferences aside, that rear fold with the top down sits awfully tall. Can all five-foot, three-and-a-half-inches of me actually see over that or will the Cabrio be the fun lil’ urban kart-car exclusively for The Talls? Our press-herders have a scavenger hunt around San Diego planned for us, so here’s hoping its claimed 58 miles of range is enough. That should give me plenty of time to flog it around, and the weather should be nice enough for us to even drop the roof. What do you want to know about the new electric drop-top Smart? Ask away in the comments below!